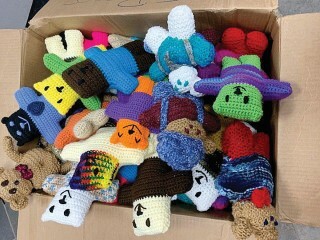 Approximately 85 hand-made crochet and knit bears were recently received by Rosemary’s Gift and Yarn Shop, 39 Roosevelt Trail in Windham. The bears (and seven monkeys) were made by 29 women from the Women’s Center at the Maine Correctional Center for Operation Sunshine Bears. Operation Sunshine Bears is the brainchild of Rosemary Libby, owner of Rosemary’s Gift & Yarn Shop, “The Largest Yarn Shop in Maine.” Knitters and crocheters create and stuff the bears, which are collected by Rosemary and her staff at the shop. The bears are then distributed to the Ronald McDonald House, the Maine Medical Child Life Program (Barbara Bush Wing in Portland), and several other organizations and agencies. In addition to the cuddly, hand-made stuffed animals, the women from the Women’s Center at MCC made 80 adult and children’s’ hats that will be distributed to local schools and the Preble Street shelter. The women at the correctional center rely on donated yarn to make their projects. They purchase their knitting needles and crochet hooks themselves, as the implements must meet certain requirements to be used within the Women’s Center. Rosemary’s Gift & Yarn Shop is hosting a yarn drive on April 27 at the shop to help keep the women crafters at the MCC Women’s Shelter supplied with raw materials. The yarn collection event will be held in conjunction with Local Yarn Store Day on April 27. The yarn collection event will be promoted on the shop’s website at www.maine-crafts.com and on their Facebook page at www.facebook.com/Rosemarys-Gift-Yarn-Shop-111390088891313/. 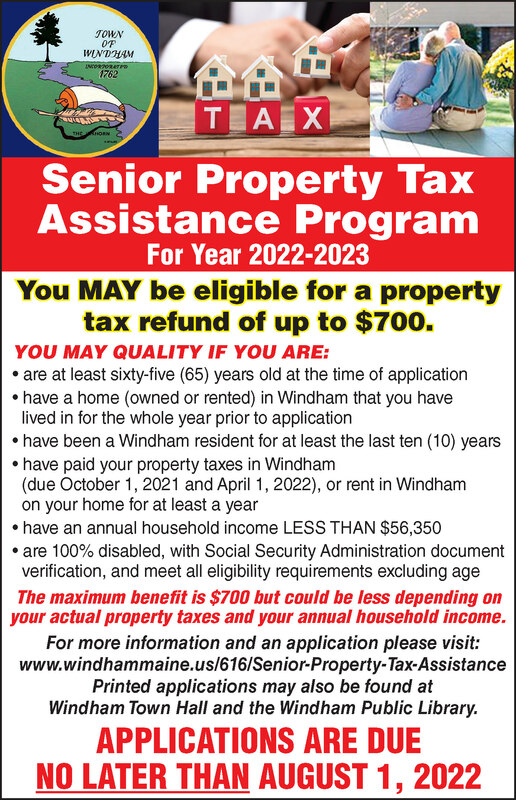 For more information, please contact Amanda Kovats of the Women’s Center at the Maine Correctional Center at 207-893-7056, or Rosemary Libby, owner of Rosemary’s Gift and Yarn Shop, at 207-894-5770. On Saturday, April 27th, at 7 p.m., Music with a Mission is proud to present Travis James Humphrey for a fun evening of original music along with some of the best covers of country, folk and honky-tonk favorites. 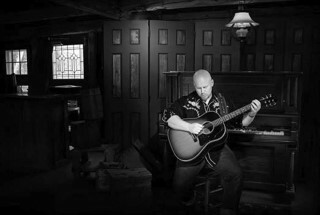 Travis James Humphrey is a professional musician and Northern Maine native who learned his trade from his father, Tim Humphrey. After high school, Travis served with the United States Air Force as a bandsman for 8 years. He returned home to Maine in 2003 and became a working musician performing regularly to packed houses at Lenny’s and other clubs throughout Southern Maine. Travis, who mostly performs solo, has released four studio albums and opened shows for B.B. King, Ricky Skaggs, Roy Clark, David Mallett, Don Campbell, The Mallett Brothers Band, and many other fine artists. The Music with a Mission concert series is sponsored by the North Windham Union Church, which donates a portion of the proceeds to area non-profits. Now in our seventh season, MWAM has provided almost $62,000 for mission support to the church and other community organizations. Travis James Humphrey has chosen to support the RSU14 Windham Raymond Backpack Program in their efforts to provide food to 150 students in 3 elementary schools each weekend of the school year giving balanced meals for the food insecure. Tickets will be sold at the door and are $12 for adults and $10 for students and seniors. They are also available online at mwamconcerts.com. The box office opens at 6 p.m. and the doors will open at 6:30 p.m. 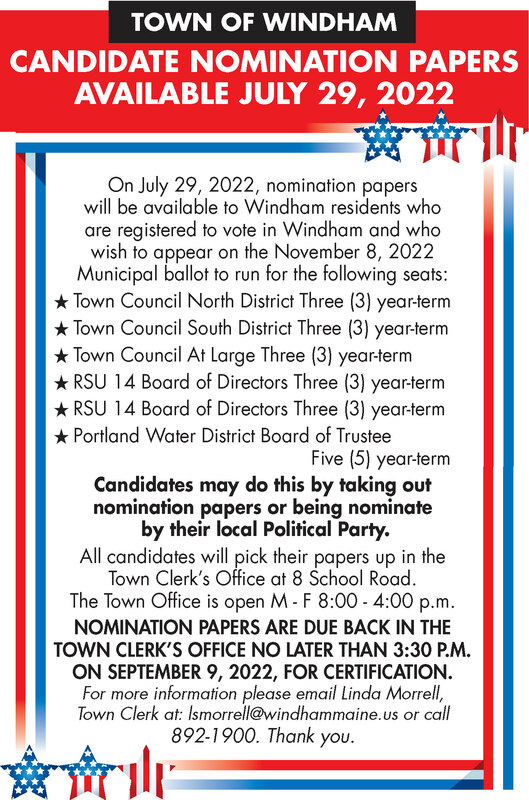 The North Windham Union Church is located at 723 Roosevelt Trail in Windham. For more information please call 892-6142 or email MWAMconcerts@gmail.com. Matthew Bell knows the importance of community and applies that every day. He is the nurse at the Manchester School in North Windham. Prior to that, he was a medic for the United States Army. He is also coaching soccer, alongside Jason Dakin, and has been doing so for several years. Before joining the Military, Bell never considered a career in the medical field. From that point, he went to the Army Medical Department Center in San Antonio, Texas and received his nursing license. Working at the Manchester School was a natural fit for Bell. He stated that the students are an engaging age group. The educators and support staff are some of the greatest with whom he’s ever worked and have the best interest of the students in mind; they are always willing to help. Bell is impressed with the teamwork and collaboration between nurses within RSU 14. Working with accomplished people who are willing to help or answer any questions has made his job even better. Bell got into coaching to be closer to his daughters. He quickly learned he was having more fun than they were. He and coach Dakin started coaching for Windham Youth Soccer Association (WYSA) at the U11/U12 level. They both have been moving up with this talented group of girls throughout the years. He and Dakin are also in their second year of coaching Velocity Soccer, a premier soccer league. Bell would like every player who plays for him to grow as an athlete, but more importantly to grow as a person and teammate. He and his wife, who is also a WHS graduate, have two daughters in the middle school. When he is not working or coaching, he enjoys spending time with his family. They like hiking, swimming and spending time outside. His youngest daughter and he have gotten back into fishing and hope to enjoy a lot more of it this spring and summer. Community is important. 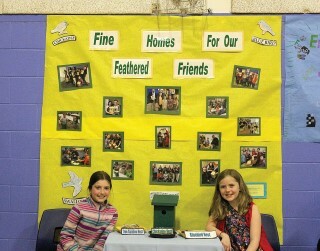 Manchester Community Day, held on Wednesday, March 10 at Manchester School in North Windham, showcased service projects by fourth and fifth grade students during the year. Friends, family and service members gathered in the gymnasium to view the projects and show support. The theme of the day focused on students caring for their neighbors and community. Principal Danielle Donnini introduced RSU14 Superintendent Sanford Prince who was one of the guest speakers. He talked about the bravery of Maine resident Samantha Smith, who wrote a letter in 1982 to Yuri Andropov, the leader of the Soviet Union, asking why he wanted to be at war with the United States. Superintendent Prince spoke about how she made a difference and how the students at Manchester School can make a difference. Superintendent Prince added giving back is more important than receiving and the importance of caring for friends, family and community members. He also spoke of building relationships with others and the difference that can make. Windham Middle School Principal Drew Patton then spoke of having role models within the community; and that Windham is full of role models. He stated that as individuals, we need to model the behaviors we want to see. After the assembly, the students separated by class to reveal the projects they had been working on all year. Students from Carol Priebe’s class, built, painted and distributed birdhouses to those who serve and protect the public. Jill Thornton’s class collected the tabs off soda cans to raise money for the Ronald McDonald House. Another project included making dog toys out of recycled t-shirts. Kelley Simpson, coordinator of the ‘Let’s Go’ program had a stationary bike with a blender on the back. 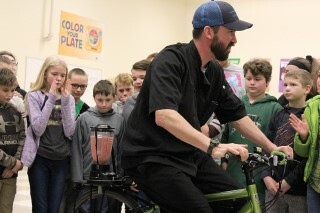 When the bike was peddled, the blender began blending fruit smoothies everyone could enjoy while getting exercise. “It’s a fun way to get physical activity while also making a healthy snack; a healthy alternative to sugary drinks. It’s been really fun and an exciting thing to bring to schools,” observed Simpson. RSU14 is well known for its incredible food service, with frequent mentions in media around the state. It has been featured on Maine Public Radio, Central Maine, and the Portland Press Herald, just to mention a few. And it continues to impress, not only with the quality of the food available, but the creativity of the whole department. 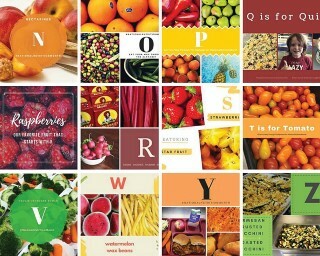 Last month’s Eat Your Way Through The Alphabet campaign is no exception. Throughout the month of March, National Nutrition Month, the entire district participated in an exploration of food that took them all the way through the alphabet. Starting with foods like asparagus and arugula and ending the month with a variety of ways to prepare zucchini, students had the opportunity to try new healthful foods without pressure. Even quinoa had a chance to be in the spotlight! veggies and create posters to hang on the cafeteria walls. Research included learning nutritional facts about the foods as well as finding preparation methods and recipes, as several of the foods students had never tried before. By the end of the project, students understood not only why the foods were healthful options, but also how to best include these foods in their future food choices. “We enthusiastically embrace this healthy eating adventure,” says Reilly, “though I must admit we are usually happy to see it end every year, but that doesn’t stop us from jotting ideas down for next year! Thank you to Reilly and her entire staff for the hard work they put into this campaign each year. We can’t wait to see what next year’s brings! Raymond Village Community Church UCC (RVCC) Pastor Nancy Foran and Music Director Patrick Martin invite everyone to a magnificent fusion of creative worship and gorgeous choral music at the RVCC Palm Sunday Service, Sunday, April 14, 10 a.m. at the church. Jerusalem and ends with his trial, scourging and death - a powerful prelude to the joy of Easter Sunday. The story is told through readings, visuals, and the music of the “sensitive and beautiful” choral work; “Requiem Aeternam”, by English composer John Rutter, performed by the RVCC Choir and a variety of guest singers. The service will last approximately an hour. This Palm Sunday collaboration will be followed by an equally powerful candlelight Tenebrae (“Shadows”) service on Maundy Thursday, April 18 at 7 p.m., and a joyous Easter Celebration Service, Sunday, April 21 at 10 a.m. 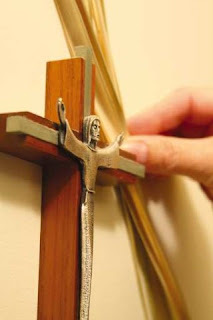 The Church will also be open to everyone for quiet meditation and reflection on Good Friday, April 19 between noon and 3 p.m.
For further information, email Rev. Foran at nancy1@maine.rr.com, or call the church at 655-7749. Raymond Village Community Church is a United Church of Christ congregation. It is a diverse faith community embracing tolerance, committed to missions and outreach, singing joyfully, and welcoming all people no matter where they are on their faith journey. For more information about RVCC, contact Rev. Nancy Foran, Pastor, at 655-7749 or revnancy@rvccme.org. Except for those who move often during the early years of life due to parental circumstance and jobs, most of us spend our young lives living in the same town and attending the same school, spending time with friends that we also consider family. But then, at the young age of approximately 18, we graduate, stepping out into a new stage in our lives, longing for new and fun experiences. There is so much to explore, and we leave the “mundane” of small-town life behind us. This is truth. This is reality. But it is also true that those in our past have stayed by our side for as long as we can remember. Friendships change as we change, but that doesn’t mean that they must fade. Nobody knows us like our oldest friends, and nobody feels like family the way they do. Just remember, while moving forward, don’t forget those who supported you for the first 18 years of your life. That’s why the Windham Alumni Association, established over 80 years ago, is here and provides an opportunity to look back annually, providing an opportunity to remember and honor our closest friends who were there in the very beginning. Seeing the importance of reconnecting the old with the youth, Harold Haskell worked to give the Windham Alumni Association new life in 1992 when the association was lacking in participation and numbers. Although, no one knows when the association began exactly, there is the common belief and agreement that the Windham Alumni association’s origin began in 1910. Elsie Haskell, Harold Clayton’s wife and mother of Town Councilor, Clayton Haskell stated that her husband wanted to give the dying association new life. “He always wanted to start it back up,” she explained. “It wasn’t until the school called us, telling us they had the bank book of past alumni, that he was able to get the organization started again.” It was at that time he became president of the association. The challenge for the association is that today’s graduating seniors do not attend the annual banquet and the numbers of participants are dwindling. But President Plummer is determined to keep the organization alive. 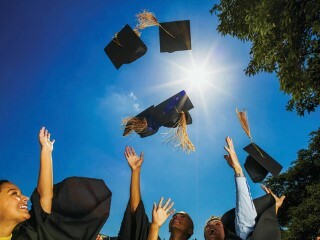 The association offers a scholarship every year to deserving seniors during the high school’s regular graduation activities. In addition, the alumni association also awards a second $500 scholarship, on behalf of the grange, to a student planning to pursue work in agriculture or a related field. Plummer has worked tirelessly to keep the Windham Alumni Association alive. In fact, he has persuaded close friends who have fallen away, on the cusp of leaving the mission of gathering people together with a common bond. Walter Lunt, class of 1964 said, “Historically, the event attracts only alumni from the older classes. If an alumnus from the 1980s, 90s or 2000s showed up, we would cheer their presence.” Lunt recognizes the importance of what it means to gather together with people who supported you in your youth. The Windham Alumni Association holds an annual banquet in May on the first Saturday after Mother’s Day. This year, the event will be held on Saturday, May 18th at the Windham Middle School Auditorium.